You may have seen on Instagram that Karen (@VintageStrings) and I are hosting the #GeorgetownOnMyMindSewAlong and I have been working on my rosettes throughout the week. "Georgetown On My Mind" is a licensed pattern by Australian designer Jen Kingwell. This pattern can be made using various techniques. I plan to hand sew mine using my own templates and will be typing up a tutorial showing just how easy this "complicated-looking" quilt can be. There are no set deadlines - you are free to sew along at your own pace, knowing that you are with good company who will keep you motivated and encourage you along the way. If you cannot dedicate your time to completing the entire quilt, you can easily turn one of the rosettes into a striking mini-quilt and still learn some new skills along the way. DISCLAIMER: This sew along is in no way affiliated with Jen Kingwell or Amitie Textiles. 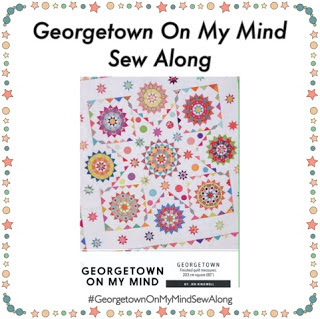 "Georgetown on my Mind" is a licenced pattern by Jen Kingwell and can be purchased from most good quilt shops or from Amitie Textiles (Jen's shop). Thank you for joining me this week as I have guest hosted 52 Quilters. You have been a most excellent hostess this week. Something new and interesting every day. Keep on quilting.